Monument Park is an open-air museum located in Yankee Stadium in the Bronx, New York City, containing a collection of monuments, plaques, and retired numbers honoring distinguished members of the New York Yankees. When Red Ruffing's plaque was dedicated in 2004, his son called it "the second-greatest honor you can have in baseball, in my opinion" trailing only induction into the National Baseball Hall of Fame. The history of the original Monument Park can be traced to the old Yankee Stadium in 1929, when the team posthumously dedicated an on-field monument to manager Miller Huggins in center field. Additional team members were honored with monuments and plaques in the area over the years. During the stadium's renovation in the mid-1970s, the center field fence was moved in 44 feet, enclosing prior monuments, plaques, and a flag pole beyond the field of play. Over time, additional plaques were added to the area and "Monument Park" became formalized; in 1985, the park was opened for public access. When the Yankees moved to their new ballpark in 2009, a replica Monument Park was built beyond the center-field fences and the contents of the old one transported over. Thirty-seven members of the Yankee organization have been honored in Monument Park, while 22 have had their uniform numbers retired. 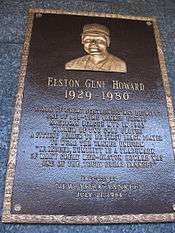 Plaques in Monument Park are a great honor for players so distinguished. The monuments mounted posthumously on five large red granite blocks are the highest honor of all. Only six Yankees have been so recognized: manager Huggins, players Lou Gehrig, Babe Ruth, Mickey Mantle, and Joe DiMaggio, and owner George Steinbrenner. The original Yankee Stadium was built in 1923. As with many other so-called Jewel Box ballparks of the era the flag pole was placed in play. With a generous center field dimension of 500 feet (150 m) to straightaway center field, there was plenty of room for it without materially interfering in play. 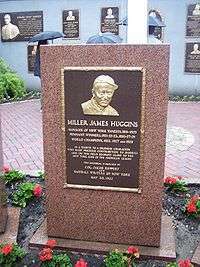 In 1929, Yankees manager Miller Huggins died suddenly, and in his honor the team erected a free-standing monument in front of the flag pole consisting of a bronze plaque mounted on an upright block of red granite resembling a headstone. This, in turn, led many Yankee fans over the years, particularly children, to believe that the players honored were also buried there upon their death. The original placement of the monuments in deep center field at the pre-renovated Yankee Stadium. The Huggins monument was later joined by similar memorials to Lou Gehrig and Babe Ruth, which were erected upon their deaths. 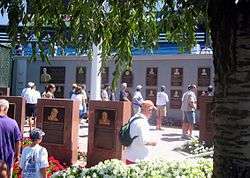 Over time, a number of plaques were mounted behind them on the outfield wall. Placing monuments in the field of play was not so unusual at the time, as there had been in-play stones and plaques at the Polo Grounds and Forbes Field. 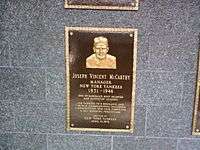 In 1969, Mickey Mantle was given a plaque by Joe DiMaggio to hang on the center field wall, who in turn gave Joe DiMaggio a plaque of his own which, in Mickey's words, had to be hung a little bit higher than his. From 1936 through 1973, the distance from home plate to the center field fence was 461 feet (141 m). Despite the distance, a batted ball still sometimes made it back there. In the 1992 book The Gospel According to Casey, by Ira Berkow and Jim Kaplan, it is reported that on one occasion a Yankees outfielder had let the ball get by him and was fumbling for it among the monuments. Manager Casey Stengel hollered to the field, "Ruth, Gehrig, Huggins, somebody get that ball back to the infield!" When Yankee Stadium was remodeled from 1974–1975, the center field fence was moved in to 417 feet (127 m) from its previous 457 feet (139 m); a subsequent reduction brought the fence in again to 410 feet (120 m). This enclosed the area, formerly in play, containing the flag pole and monuments. 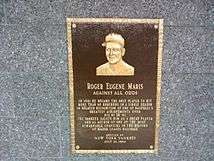 As this fenced in area between the two bullpens gathered additional plaques on the original wall it began to be referred to as "Monument Park". With the formalization of the area as an official Monument Park, the Mantle and DiMaggio plaques were removed from the wall upon their deaths and mounted on red granite blocks matching the original three of Huggins, Gehrig, and Ruth. It was an achievement for a home run to reach Monument Park on the fly. Among those who did so were Thurman Munson (in Game 3 of the 1978 ALCS) and Alex Rodriguez (in August 2005). Monument Park was inaccessible to fans until 1985. After the center field fence was moved in, the Yankees enabled fans to visit Monument Park prior to most games at Yankee Stadium. Monument Park was also part of the public tour of the venue. When the Yankees moved to their new ballpark, the Yankees established a new Monument Park in the new stadium. An area was built behind the fence in straightaway center field, below the Mohegan Sun Sports Bar that serves as the batter's eye. Built of pearl blue granite from Finland, this new monument park features the five Yankee monuments in a central area around a black marble Yankees logo. This is flanked by two short stone walls which hold the retired numbers. The plaques are mounted on the back wall and the September 11 monument is on one end of the park. In contrast to the old stadium, the new Monument Park is not readily visible from the field, and its relatively drab appearance and inconspicuous placement have led some to derisively nickname it "Monument Cave". Spectators can visit Monument Park prior to the beginning of each game. It closes 45 minutes before first pitch. Although the Yankees adopted uniform numbers in 1929, McCarthy never wore a number with the Yankees. Ruppert's plaque was placed on the outfield wall, to the right of the flagpole. The Lou Gehrig monument was placed to the left of the Huggins monument. Gehrig was the first Major League Baseball player to have his uniform number retired. 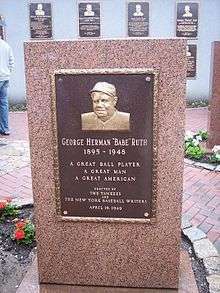 The Babe Ruth monument was placed to the right of the Huggins monument. 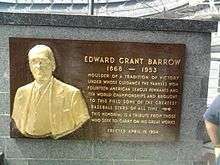 The Ed Barrow plaque was placed on the wall, to the left of the flagpole. In honor of Jackie Robinson's unique place as the first black player of the modern era, his number 42 was retired throughout baseball on April 15, 1997, the 50th anniversary of his debut with the Brooklyn Dodgers. The Yankees erected a plaque for Robinson reading: "In becoming the first Major League player to break the color barrier, Jackie will forever be an inspiration with his grace, dignity and perseverance. His story and the stories of those who never had the same opportunity must never be forgotten." 42s were also painted in front of each dugout. Players active at the time of the number's retirement in 1997 were granted a special exemption permitting them to continue wearing the number for the remainder of their careers; the last such active player to wear number 42 was Yankee relief pitcher Mariano Rivera. The Yankees honored Rivera by retiring his uniform number on September 22, 2013, during his final season, making him the first active player to be enshrined in Monument Park. Mantle wore his #7 when he coached the Yankees in 1970, even though it was retired the previous year, while Berra wore his #8 while he coached the Yankees from 1976 through 1985, though it was retired in 1972. Similarly, when Martin returned to manage the Yankees in 1988, he wore his #1, which had been retired in his honor in 1986. ↑ The ceremony was scheduled for April 15, which is Jackie Robinson Day, but it was delayed by rain. ↑ "Results in Major Sports Yesterday". The New York Times. May 31, 1932. Retrieved November 25, 2011. (subscription required (help)). 1 2 Red, Christian (June 7, 2008). "Yankee Stadium's Monument Park: Stories of place where legends go". New York Daily News. Retrieved August 21, 2012. ↑ "Quite A Day For Mickey At Proud Yankee Stadium". Herald-Journal. Spartanburg, South Carolina. Associated Press. June 6, 1969. p. 9. Retrieved April 16, 2014. ↑ Migoya, David (July 13, 2008). "Yankee Stadium>> In its final season, "The House That Ruth Built" hosts the All-Star Game at 6 p.m. Tuesday, KDVR-31". The Denver Post. p. C-09. Retrieved April 18, 2012. (subscription required (help)). 1 2 3 Sandomir, Richard (September 21, 2010). "Everyone Agrees: Steinbrenner's Plaque Is Big". The New York Times. Retrieved November 25, 2011. ↑ DiComo, Anthony (November 12, 2008). "Monument of Babe Ruth removed: Artifact will make its way to new Yankee Stadium by year's end". MLB.com. Retrieved September 17, 2009. ↑ Newcomb, Tim (June 27, 2014). "Ballpark Quirks: Yankee Stadium's living museum in Monument Park". SI.com. Time Inc. Retrieved September 8, 2014. ↑ Madden, Bill (May 9, 2009). "An open letter to Boss: Please, fix Yankee Stadium". New York Daily News. Retrieved May 23, 2009. ↑ "Impressions of the Opener". The Journal News. April 16, 2009. Retrieved August 24, 2010. ↑ Brunell, Evan (August 24, 2010). "Steinbrenner to be honored in Monument Park". CBS Sports. CBS Sports. Retrieved September 11, 2010. ↑ "Memorial to Lou Gehrig Unveiled". St. Petersburg Times. Associated Press. July 7, 1941. Retrieved October 28, 2011. 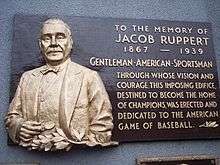 ↑ "Yankees Will Honor Col. Jacob Ruppert". The Spokesman-Review. Associated Press. April 9, 1940. p. 13. Retrieved October 28, 2011. ↑ Roden, Ralph (April 20, 1949). "Six Home Teams Score Victories in Opener". St. Petersburg Times. p. 8. Retrieved September 18, 2009. ↑ "An American icon: DiMaggio honored at Yankee Stadium with monument". Sports Illustrated. Associated Press. April 25, 1999. Retrieved September 17, 2009. ↑ Wallace, William N. (April 21, 1976). "Yanks Top White Sox, 5–4, As Shirt Dispute Flares; Yankees Win, 5–4, In a Shirt Battle". The New York Times. Retrieved April 18, 2012. ↑ "To Honor Casey". The Bryan Times. United Press International. October 2, 1975. Retrieved October 28, 2011. ↑ "Yankee Fans Pay Tribute to Catcher". Star-News. August 4, 1979. p. 3-B. Retrieved October 28, 2011. 1 2 "The Man Who Beat The Babe". Waycross Journal-Herald. July 24, 1984. p. 6. Retrieved April 18, 2012. ↑ Kerber, Fred (August 14, 2007). "For 'dreamer' Scooter, a moo-ving day". New York Daily News. Retrieved August 28, 2010. ↑ "Yanks Retire Martin's Number". Daytona Beach Morning Journal. August 11, 1986. p. 5C. Retrieved October 28, 2011. 1 2 Shaughnessy, Dan (August 21, 1988). "Is Balance Of Al Power Headed West?". Boston Globe. Retrieved April 18, 2012. ↑ Chass, Murray (September 1, 1997). "On Baseball — Mattingly's Monument To Effort". The New York Times. Retrieved August 28, 2010. ↑ Davidoff, Ken (July 25, 1998). "Allen Joins Yankee Immortals". The Record. Bergen County, New Jersey. Retrieved August 28, 2010. (subscription required (help)). ↑ Madden, Bill (May 8, 2000). "For Once, Sheppard Is Speechless: Yanks hail keeper of names". New York Daily News. Retrieved August 28, 2010. ↑ Lupica, Mike (July 6, 2002). "Reggie Means World To Yanks". New York Daily News. Retrieved August 28, 2010. ↑ "Baseball — Yankees Pay Tribute to Guidry". The New York Times. August 24, 2003. Retrieved August 28, 2010. 1 2 "ESPN — Yankees honor Robinson — MLB". Sports.espn.go.com. April 18, 2007. Retrieved August 24, 2010. ↑ Marchand, Andrew (September 20, 2010). "Yanks unveil Steinbrenner monument". ESPN. Retrieved September 20, 2010. ↑ Feinsand, Mark (September 22, 2013). "Yankees retire Mariano Rivera's No. 42 in Monument Park during pregame ceremony". Daily News (New York). Retrieved September 22, 2013. 1 2 3 4 "Yankees to honor Joe Torre, Rich "Goose" Gossage, Tino Martinez, and Paul O'Neill in 2014 with plaques in Monument Park; Torre's uniform no. 6 to also be retired: Ceremonies are part of a recognition series that will include Bernie Williams in 2015". MLB.com (Press release). May 8, 2014. Retrieved June 23, 2014. ↑ Corcoran, Cliff (May 22, 2015). "Jersey retirement a chance to finally appreciate Bernie Williams: Five-time All-Star Bernie Williams to have number retired by Yankees". Sports Illustrated. Retrieved May 24, 2015. ↑ "Willie Randolph being honored at Old-Timers' Day on Saturday – The LoHud Yankees Blog". The LoHud Yankees Blog. Retrieved June 21, 2015. ↑ McCarron, Anthony (June 20, 2015). "Yankees surprise Mel Stottlemyre with Monument Park plaque on Old Timers' Day at the Stadium". New York Daily News. Retrieved June 20, 2015. ↑ McCarron, Anthony (August 22, 2015). "Jorge Posada has No. 20 retired by Yankees on 'one of the happiest days of my life'". New York Daily News. Retrieved August 23, 2015. ↑ O'Brien, Charles (August 23, 2015). "Yankees honor Pettitte by retiring his No. 46". The Charlotte Observer. Associated Press. Retrieved August 23, 2015. 1 2 Callahan, Maureen (March 30, 2014). "Jeter's retirement marks end of Yanks' single-digit numbers". New York Post. Retrieved May 8, 2014. ↑ "The Official Web Site". Lou Gehrig. June 3, 1932. Retrieved October 28, 2011. ↑ Hoch, Bryan (April 15, 2007). "Rivera 'blessed' to wear No. 42". MLB.com. Retrieved May 27, 2011. ↑ Begley, Ian (September 22, 2013). "Yankees honor Mariano Rivera". ESPN.com. Retrieved September 22, 2013. ↑ Matuszewski, Erik (September 20, 2010). "George Steinbrenner Monument to Be Unveiled Today Before Yankees-Rays Game". Bloomberg. Retrieved April 22, 2013. ↑ "Baseball plans tributes for 9/11 | MLB.com: News". Mlb.mlb.com. Retrieved April 22, 2013. ↑ Glasspiegel, Ryan (December 9, 2013). "The Yankees Will Honor Nelson Mandela with a Plaque in Monument Park | Extra Mustard – SI.com". Extramustard.si.com. Retrieved April 16, 2014. ↑ "New York Yankees to honor Nelson Mandela in Monument Park – ESPN Chicago". Espn.go.com. December 9, 2013. Retrieved April 16, 2014. 1 2 . "Rainout Postpones Yankee Stadium Ceremony Honoring Nelson Mandela – NY1". Bronx.ny1.com. Retrieved April 16, 2014.